Polyrhythmic synchronization and a traditional repertoire, mark the tour de force performance of Al Bilali Soudan. This their first international release brings the verve of desert celebrations outside of Mali. The group’s leader, Abellow Yattara, comes from a family of musicians and has been a playing the tehardent since the age of 10. His group is made up of relatives who have known each other for their whole lives. A tour de force of improvisation and spirit. 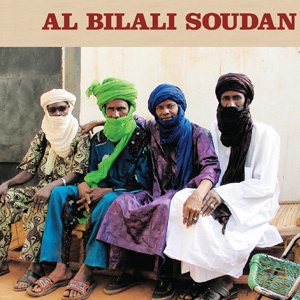 Al Bilali Soudan’s relaxed performance is an improvisational tour de force of traditionally based rhythms and scales. The group’s name is the ancient name of the city of Timbuktu. The style is Tashigalt or simply Tehardent after the traditional stringed instrument of these forgeron musicians. The group’s leader, Abellow Yattara, hails from a well-known Tuareg forgeron family which has performed this music for generations.